Cleanup in aisle soup! 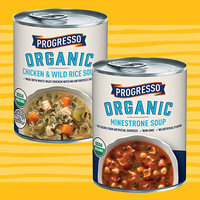 These organic soups from Progresso are non-GMO with no added MSG, artificial colors, artificial flavors, or preservatives. SOUP-ER! 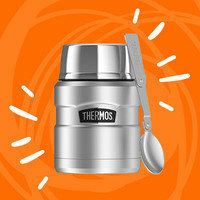 Plus, they come in non-BPA cans, and most have under 100 calories per serving. Try all six: Chicken & Wild Rice, Minestrone, Tomato Basil, Southwest-Style Black Bean, Chicken Noodle, and Savory Lentil. Can you say "new pantry staple”? Kashi has been crushing the frozen entree game for years, and our taste buds are thrilled about these fully vegan offerings! The newbies are packed with veggies and whole grains. 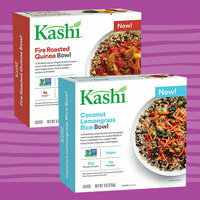 Whether you're in the mood for brown rice, golden quinoa, or house-made noodles, Kashi has you covered... Covered in delicious sauces, that is! Skip takeout tonight, and pick these up in the freezer aisle. We love creative food combos, but we never thought to combine tacos and hummus. 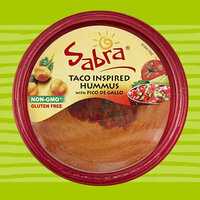 Brilliant, Sabra! This Mexican-style chickpea spread comes with a thick salsa topping. You can bet we'll be dipping mini bell peppers and baked tortilla chips into it for a healthy snack. Find it in select stores: Meijer and more! Happy October 9th! It's... er... National Moldy Cheese Day? Sounds scary, but technically blue cheese qualifies, so we're ready to celebrate with a Hungry Goddess Wedge Salad! Share this info ASAP -- click “Send to a Friend” now!